Just three contenders remain in the hunt for $8.8 million and a place in poker history as the 2018 World Series of Poker Main Event champion: Tony Miles, John Cynn and Michael Dyer. Those three outlasted Aram Zobian, Nicolas Manion and 2009 Main Event champ Joe Cada on what proved to be a wild day in which the chip counts and final standings look nothing like where they started about seven hours earlier. 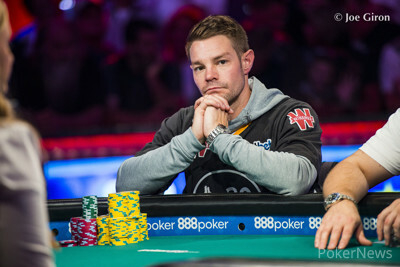 Whereas it looked like Dyer might run away with things a la Joe McKeehen in 2015 — he came in with about 40 percent of the chips in play — he's now been reduced to the short stack after a downhill slide that saw him bag just 26.2 million, good for only 16 big blinds. Instead, it's Tony Miles who has risen from fourth place to finish the day with a sizable edge, racing out ahead of his final two competitors and bagging 238.9 million; about 60 percent of the total chips. "It's indescribable," Miles said of bagging the lead with just three players remaining. "It's a dream come true. It's truly magical." Cynn rounds out the field with 128.7 million. The story dominating headlines coming in, Cada's attempt to win an unprecedented two post-boom Main Event titles, ended about 30 hands into Day 9 at the hands of Miles. With five players left — Zobian fell victim to Dyer early on — Cada opened for 2.2 million under the gun at 500,000/1,000,000/150,000 and Miles three-bet it to 6.9 million on the button. Cada, who repeatedly showed a willingness to put his stack at risk leading into and during Day 9, shoved for 47.65 million. Miles went into what looked to be a pained thinking process before he found the call button with ace-king. Cada rolled over pocket tens and the race was on. The hallmark of Cada's 2009 final-table run was his ability to win preflop all ins with pocket pairs, often times against bigger ones, but the flip wouldn't go his way. Miles flopped a king, much to the delight of a rail that ranked as easily the most raucous in the house. "I didn't think that he would be shoving that wide," Miles said of the hand. "I thought that he would be flatting a lot of stronger hands just because of some things that I was taking into consideration. We are playing for a lot of money and there's a lot of pressure, so I just wanted to take my time and get the decision right." Cada's tens couldn't hold against the ace-king of Miles. After fading the turn and river, Miles suddenly found himself over 100 big blinds and within striking distance of Dyer. A lead that seemed insurmountable melted away when three players saw a king-four-three flop, with Miles holding a set of threes. He bet when checked to and Dyer raised to 14.3 million. He barreled again for 21.4 million on a five turn and then check-called a big bet of 27 million when the king paired on the river. The stream would later show Dyer had flopped bottom two pair. Dyer reclaimed his lead a bit later but then paid off two streets to Miles when the latter made aces full on a double-paired board and bet the river big. Dyer also got unlucky when he couldn't fade a flush draw that Manion jammed on the flop. The start-of-day leader couldn't do anything with those chips though, following his fellow Michigan native Cada to the payout desk when he ran ace-ten into Cynn's kings. That meant bagging time for the final three. There remains just over 50 minutes in Level 40 (800,000/1,600,000/200,000). The players will return at 5:30 p.m. local time on Saturday and play until the face that will adorn the next banner is the only one left. Miles and his rowdy rail have positioned themselves for the party of a lifetime if he can finish the job. "Those people are my heart," he said. "It means the world to me to be able to come out here and show them what we work so hard for all the time. My dad's always asked me, 'Why do you play tournaments? Why don't you just stick to cash games?' and I'm always telling him one day you could win life-changing money." "It's a dream come true, I'm truly blessed and I'm honored to be here." Miles still has two more opponents to get through, though, and the poker world's collective eyes will be trained on the final day of poker's biggest tournament on Saturday to see who emerges as champion. Sarah Herring talked to Miles and Cynn after play. Hand #224: John Cynn raised to 3.8 million from the button and Nicolas Manion shoved from the big blind for 23.8 million. Cynn snap-called. The flop came to keep Cynn ahead. The turn brought them the and Cynn was still looking good. The completed the board on the river and Cynn's rail went mental as Cynn's pocket kings held up. 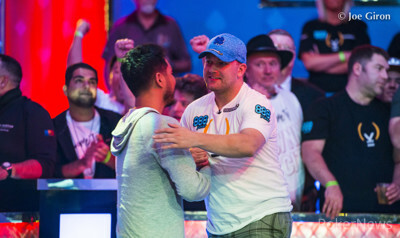 Manion was eliminated in 4th place for $2,825,000. Play has finished for today and a full recap of today's action is to follow. Hand #223: John Cynn called in the small blind and Tony Miles raised to 5 million in the big blind. Cynn called. The flop came , Cynn check-called the bet of 6.6 million of Miles. The turn brought them the , Cynn checked again without any hesitation. Miles did the same. The on the river completed the board and they both checked again. Cynn tabled for the flush which was good enough to make Miles muck his own hand. Hand #220: John Cynn opened to 3.8 million from the button and won the blinds and antes. Hand #221: Tony Miles raised to 3.2 million from the button and collected the blinds and antes. Hand #222: Tony Miles opened to 3.2 million from under the gun and John Cynn defended his big blind. The flop came down , Cynn checked, Miles bet 3.9 million and Cynn called. The turn was the , both checked and river completed the board. Cynn bet 5.6 million, Miles folded and Cynn won the pot. Hand #216: Tony Miles open-shoved in the small blind and Nicolas Manion folded. Hand #217: Manion jammed in the small blind and won the pot. Hand #218: Michael Dyer completed in the small blind and John Cynn checked. Dyer bet 1.8 million on the flop and Cynn peeled, bringing the . Cynn bet 4.2 million and Dyer was in there with a quick call. Dyer checked again on the river. Cynn bet 11.8 million and Dyer quickly mucked. Hand #219: Cynn completed and Miles checked. Cynn check-folded to 1.7 million on . Hand #211: John Cynn called in the small blind and Tony Miles opted to check. The flop came , Cynn bet 1.8 million and Miles called. The turn brought them the , Cynn now checked. Miles bet 5.6 million and Cynn folded. Hand #212: Cynn raised to 3.8 million from the button and picked up the blinds and antes. Hand #213: Cynn raised to 3.8 million again but now from under the gun and got no action again. Hand #214: Michael Dyer called in the small blind and Cynn raised to 4.5 million. Dyer shoved for 34.5 million. Cynn snap-folded. Hand #215: Cynn completed his small blind and Miles raised to 5 million. Cynn called. The flop came , Cynn check-called the 6.6 million bet of Miles. The turn brought them the , Cynn checked again. Miles decided to now bet 8.9 million. Cynn folded. The flop came down and Manion check-folded to Cynn's continuation bet of 3 million. Hand #209: Michaell Dyer received a walk in the big blind. Hand #210: Tony Miles raised to 3.2 million from under the gun, Manion three-bet shoved for 24.2 million from the button and Miles mulled it over for a bit before he folded. Hand #203: John Cynn completed and Tony Miles checked. They checked down until Cynn bet 3.7 million. Miles thought for awhile and called but couldn't beat . Hand #204: Miles shoved all in from the small blind and Nicolas Manion showed and mucked. Hand #205: Cynn raised to 3.2 million under the gun and won the pot. Hand #206: Miles opened for 3.2 million and won the pot. Hand #207: Cynn completed and Miles raised to 5 million. That won him the pot. Hand #198: A walk for John Cynn. Hand #199: A walk for Tony Miles. Hand #200: Michael Dyer raised to 3.2 million from under the gun and John Cynn called on the button. 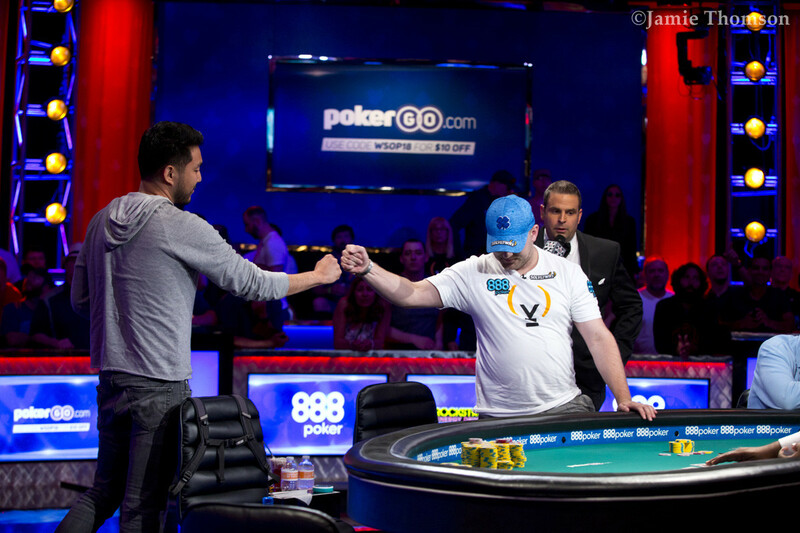 The flop came , Dyer continued with a bet of 2.8 million and Cynn folded. Hand #201: Cynn raised to 3.8 million and got no action. Hand #202: Dyer completed his small blind and Cynn raised to 5.5 million. Dyer gave up. Hand #195: John Cynn limped from the small blind, Tony Miles raised to 6 million from the big blind and Cynn folded. Hand #196: Tony Miles limped from the small blind, Nicolas Manion shoved for 34.2 million from the big blind and Miles folded. Hand #197: Tony Miles raised to 3.2 million from the button and Michael Dyer called from the big blind. The flop came down and Dyer check-called 4.5 million from Miles. The turn was the , Dyer checked and Miles bet 9 million. Dyer folded, giving Miles the pot. Hand #193: John Cynn raised to 3.2 million first to act and Tony Miles made it 10 million on his left. Cynn thought about a minute and folded. Hand #194: Nicolas Manion raised to 3.2 million on the button and Cynn defended big blind. Cynn checked and Manion bet 3.4 million on . Cynn put in a small check-raise to 8.8 million. Manion gave it up. Hand #190: Michael Dyer completed his small blind and John Cynn checked in the big blind. The flop came , Dyer bet 1.8 million and took the pot with that bet. Hand #191: Cynn completed his small blind and Tony Miles checked. The flop came and both players checked. The turn brought them the , Cynn now bet 1.8 million and Miles called. The on the river completed the board. Cynn decided to continue with a bet of 4.9 million and Miles folded instantly. 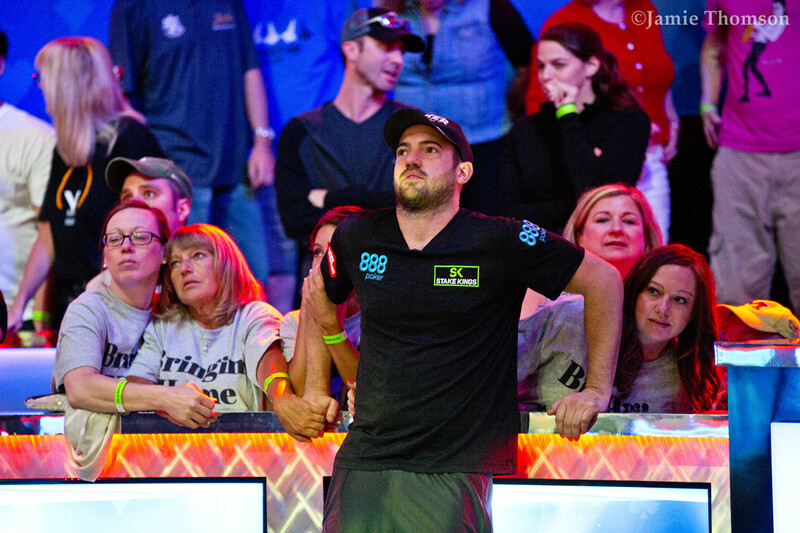 Hand #192: Dyer raised to 3.2 million from under the gun and Nicolas Manion called in the big blind. Manion was sitting on a flush draw and Dyer had flopped top pair with the queen in his hand. The rest of the board was completed with the on the turn to give Manion a flush. The on the river was just a formality and Manion doubled up. Hand #187: Nicolas Manion shoved all in for 20.6 million and took it down. Hand #188: John Cynn raised to 3.8 million on the button and took it down. 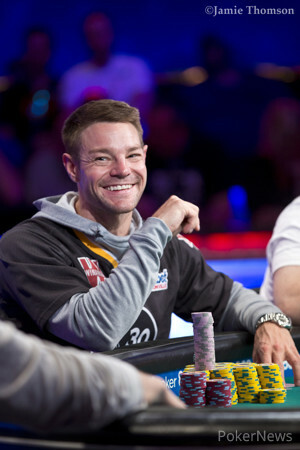 Hand #189: Tony Miles made it 3.2 million on the button and Dyer called. Dyer checked the flop and called 4 million from Miles. Both checked the to the . Dyer bet 5.2 million and Miles called with , besting . 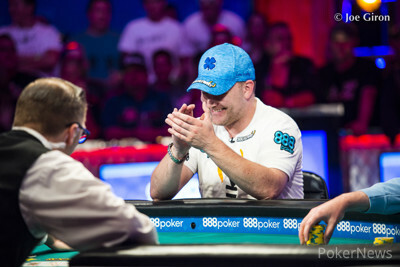 Hand #186: Michael Dyer completed and John Cynn made it 3.5 million. Dyer put in a reraise to 11.9 million. That won him the pot. The players are now on a 15-minute break. Hand #183: Michael Dyer raised to 2.4 million on the button and Tony Miles three-bet to 9.2 million in the big blind. Dyer folded. Hand #184: Dyer raised to 2.4 million from under the gun and Nic Manion called in the big blind. The flop came and Manion check-folded to the 2.175 million bet of Dyer. Hand #185: Miles raised to 2.4 million on the button and Dyer called in the big blind. The river completed the board with the , Dyer continued with a bet of 5.325 million, and Miles called. Dyer showed but was beaten by the of Miles who had flopped a pair of sevens. Hand #178: Michael Dyer completed and John Cynn checked. Dyer bet 2.325 million on and won the pot. Hand #179: Nicolas Manion shoved all in for 28.35 million and swept up the blinds and antes. Hand #180: Cynn made it 2.9 million on the button and took it down. Hand #181: Tony Miles made it 2.4 million on the button and took it down. Hand #182: Dyer completed and Cynn checked. Dyer bet 1.325 million on the flop and took it down. Hand #175: Michael Dyer raised to 2.4 million from the button and Tony Miles called from the big blind. The flop fell and MIles check-called 2.175 million from Dyer, landing the turn. Both checked, the river completed the board, and both checked again. Miles showed and Dyer mucked. Hand #176: John Cynn raised to 2.9 million from the button and got no action. Hand #177: Tony Miles raised to 2.6 million from the button and won the blinds and antes. Hand #171: John Cynn completed his small blind and Tony Miles opted to check the big blind. The flop came and both players checked through to the on the turn. Cynn bet 1.4 million and Miles folded. Hand #172: Michael Dyer raised to 2.4 million from the under-the-gun position and Nic Manion called in the big blind. 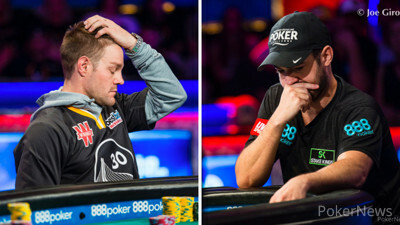 The flop came , Manion check-shoved on the 2.175 million bet of Dyer for 23.775 million, and Dyer folded immediately. Hand #173: Miles raised to 2.5 million from the button and got no action. Hand #174: Dyer called in the small blind and Cynn checked his big blind. The flop came , Dyer bet 1.325 million, and Cynn threw his cards over the line.